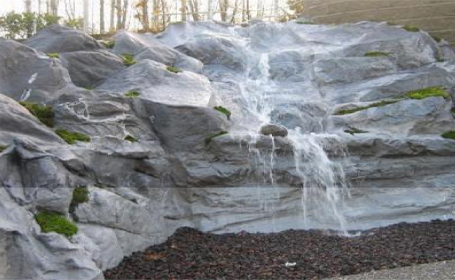 WaterfallNow creates custom landscape waterfalls in the Lower Mainland, BC. 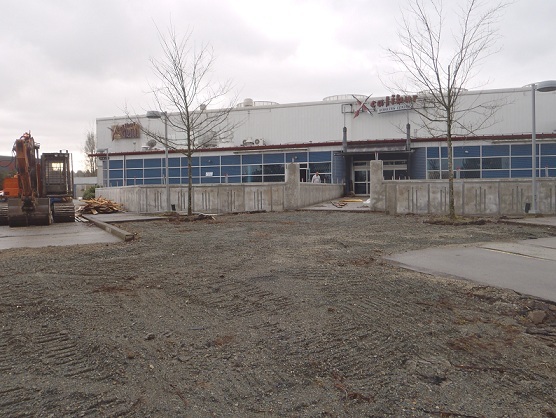 Xcalibur closed – “Aria” a new banquet hall & convention center to take its place. Expected open date sometime in April. We are helping out with the renovations. Updates to follow. WaterfallNow operates in a very niche market that requires much creativity and problem solving ability than the average landscaping project. WaterfallNow’s small team of experienced artists have the experience and creativity to get things done. The simple yet unique blend of synthetic and natural materials used to create each durable and long-lasting rock panels was the result of many years of trial and error. WaterfallNow has the knowledge and creativity to put together multiple rock panels to resemble a realistic final product without quitting halfway. The many years of experience in water feature design and landscaping background makes the process look simple to onlookers. Landscape Waterfalls are not something that anyone can go out and purchase from a store. This makes the practice of creating custom waterfalls both a lucractive opportunity as well as a skill that is in high demand. WaterfallNow in a sense brings its manufacturing station to the client and assembles on-site. Funny story. One of our clients that we had built a large waterfall for (that photo gone along with our old domain rockywaterfall.com) was interested in creating them after seeing how ‘simple’ it was. So with our support he attempted to create his own waterfalls using our rock panels. We still joke about it to this day because that ‘attempt’ was not something that could be sold and quite frankly anyone would be embarassed about. The important thing is not to give up no matter how bad it may seem. That experience really showed us that while we know what we do isn’t that complicated, it isn’t something that anyone can just one day wake up and decide to do as a business – and be successful. The WaterfallNow team was also blessed with the many previous landscaping clients to learn and grow with through word-of-mouth referrals. Our products and services are suited for those looking for unique and eye-catching custom waterfalls that can’t be replicated using traditional concrete methods. We appreciate what others in the water features industry do because together they all contribute and grow together. Whether it is with concrete, styrofoam, natural stone, or wall-mounted features WaterfallNow understands that they are all a part of the landscape waterfalls and water feature community. We have experienced for ourselves the different facets, upsides, and even downsides to each particular niche even with regards to koi ponds but ultimately finding one that we were most comfortable with. When WaterfallNow (formerly Rocky Waterfall) was just starting out we had no idea whether or not this idea would ever take off. We had our fair share of setbacks but were also surprised at how smoothly things went from time to time. It was never that way back in the landscaping days. Contract work for smaller landscaping businesses often goes underappreciated because it is a common skill with high competition. Reflecting on it, WaterfallNow is proud of the landscape waterfalls that they’ve created thus far and also excited about the ones that have not yet even been designed. The market potential of the entire rock water features industry in Surrey and the Lower Mainland is much bigger than most people think. WaterfallNow’s landscape waterfalls continue to be a unique product in the BC marketplace. We hope to continue spurring on the trend that we have started years ago. The versatility and genius behind the rock paneling system is definitely catching on (whether concrete, fiberglass, or a blend) and we hope to see more landscapers adding it to their portfolio. Sample landscape waterfalls can be viewed in certain areas of the Lower Mainland. Moving forward WaterfallNow looks to establish itself in Surrey as a trustworthy company with the experience and creativity to serve a wide client base. Have ideas for landscape waterfalls in the future? Feel free to contact us for pricing and other enquiries. Are you wondering what type of water garden plants to use on an outdoor rock waterfall? Consider choosing water-loving species to landscape your rock waterfall. Choosing the right water garden plants makes a significant difference in the look and feel of the waterfall as the different colors help to contrast the rocks from the surrounding landscape. 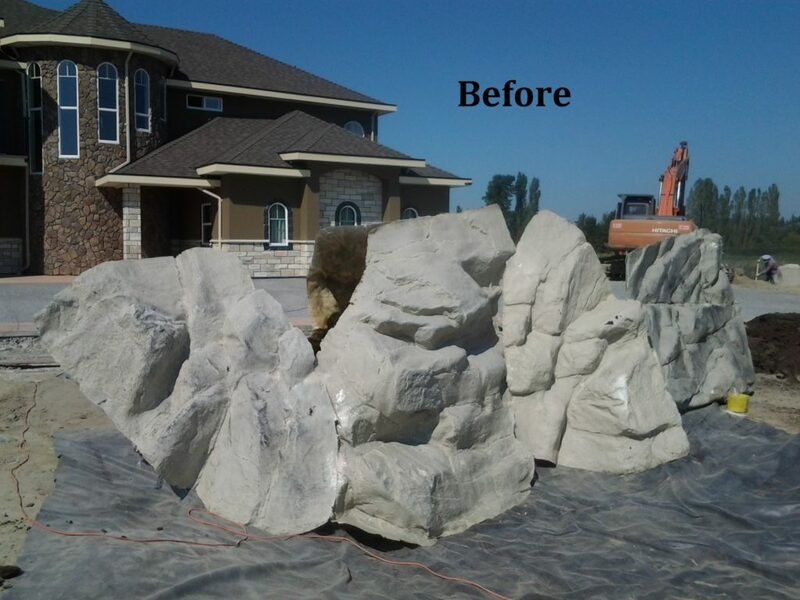 Having an outdoor rock waterfall in your backyard or as part of your landscaping is a feature growing in popularity because of its beauty, serenity and appeal. Moreover, people aren’t just looking for something everyone has seen before. WaterfallNow seeks out the wow factor in every blank slate. Selecting the right water garden plants to complement and complete your outdoor rock waterfall is often an overlooked element to creating a beautiful finished product. Plant along the rock face, along the pond, along the water’s edge, and if you have one, on the pond. Depending on the location you may be able to employ artificial plants for less maintenance, less hassle. WaterfallNow provides a selection of artificial plants including artificial turf, artificial moss, artificial fungi, and artificial bonsais that complements each waterfall. A mixture of decorative plants such as water lilies, along with fillers such as moss, fungi, or ferns all help to give the outdoor or even indoor rock waterfall a more natural and balanced look. The difference in a properly landscaped waterfall vs. a waterfall without the finishing touches is massive. These can be placed around the rock face to add more detail. Sample slideshow found online from a random water garden landscaping company. Shows how easy it can be. The following are just some ideas of water garden plants to consider but you can use any type of plant you wish. We have employed many different types of trees from regular coniferous to exotic palm trees. The use of trees create an excellent impression of a more realistic rock waterfall. Keep in mind that different trees drop different leaves that may end up in the pond which in turn may clog the pumps and drainage. Outdoor ponds can have screening systems put in place to prevent these clogs altogether. 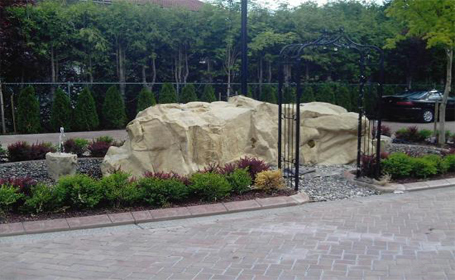 Shrubs are great in combination with trees to add more interest and beauty to your outdoor rock waterfall. (juniper, holly, yucca, dracaenas, camellia, azaleas, viburnum). 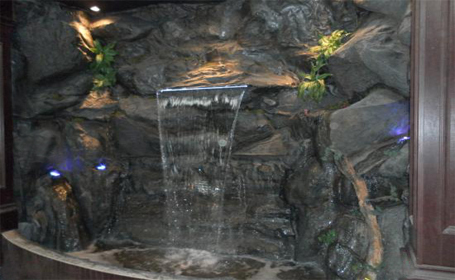 Ferns are a type of plant that look exceptional when placed around the rock waterfall as they add more realism. Select ferns that are best acclimatized to your local area for best results. An area WaterfallNow has not yet tapped into just yet but are without a doubt an excellent addition to the backdrop or even to be placed on or around an outdoor rock waterfall. Flowers help to add color and depth to any rock waterfall. You can get creative with this area and select plants that best contrast with the colour of your outdoor rock waterfall. WaterfallNow has artificial fungi and mosses that we place on the rock face of our outdoor and indoor rock waterfalls. These help to add increased realism and a more natural look to the waterfall. Water lilies are a good option for your koi pond to add color and interest to the water feature. Other options are lotus flowers, yellow floating hearts, and water poppies to fulfill said goals. Plants that can be planted along the waters edge include blue-eyed grass, or golden sweet flags as they both thrive along water in moist soil or shallow water. Other plants suited for growing around a rock waterfall are the pink bog primrose, the busy lizzie, or the sierra shooting star (thrives in sandy, clay, or regular moist soil). Cannas are a good option that thrive in moist soil and full sunlight. WaterfallNow employs both natural grass as well as artificial grass. Give us a call to book a FREE estimate and secure a spot on our waiting list. Each one of WaterfallNow’s water features and waterfalls starts off as an idea that produces spectacular results. Using various methods we are able to seamlessly blend each custom water feature. Unlike concrete or natural rock applications that are limited in size and texture (usually stamped), our hand-made artificial rock panels come with great detail and design that are difficult to mimic otherwise. We start out by selecting the right rock panels for the location. Once that is sorted out we begin cutting and shaping the fake rock panels to create the water feature. The resulting custom water feature designs are generally something difficult to tell apart from the real thing. The texture, dips, and natural contours of the outer shell are difficult to mimic using concrete applications. We prefer to use this method not only because of the versatility but also because of the problems that we were noticing with concrete applications (mainly cracking due to freeze-thaw and temperature issues). The majority of waterfall projects that WaterfallNow has worked on up until now are pondless waterfalls. Should you have an existing pond we will be able to include our rocks as an add-on feature. While we have many years of experience in traditional landscaping we now specialize primarily in the creation of custom rock water features. We can still assist you as the owner in finding the right people to accomplish all of your renovation needs. This includes and is not limited to hiring people to build you a (koi) pond. There is virtually no limit to the level of creativity that one can have. Our biggest projects have yet to be seen. Feel free to contact us if you are looking for custom water feature designs or are just looking for some design ideas in the Lower Mainland area. Are you looking to build a backyard waterfall? WaterfallNow is experienced in creating beautiful water features for clients that want to enhance their outdoor living areas. We provide a unique touch to each project that leaves our clients happy and not worrying about constant maintenance. Are you looking to DIY? There is an endless supply of information on how to build a backyard waterfall on YouTube. YouTube is the second largest search engine after Google and is an excellent source of information and new ideas. I know you want to build a backyard waterfall but doesn’t have to be complicated. There are many resources available online to show you how you can build your own water features. While reviewing some information and actually building a waterfall feature are two separate things, with some experience, you too can enjoy the relaxing sounds of running water. Need help coming up with some ideas? Feel free to email us a photo of your project to receive some consultation (778)-788-8603. There are many low-cost methods available to people who want to create their own water feature. WaterfallNow specializes in a blend of natural and synthetic materials such as fiberglass, and other natural minerals to create a long-lasting exterior. WaterfallNow has created many indoor water features for clients throughout Surrey, Burnaby, Vancouver and surrounding areas. When we started out searching for ways to create custom works of art that could be enjoyed both indoors and outdoors we did what most people do which is learn traditional methods. Concrete, styrofoam, natural rock formations, sprays, and paneling systems were all a part of the learning experience. As we began working with builders we began to notice that there was an untapped market for custom indoor water features in Vancouver and for the rest of BC in general. That realization resulted in a search for less traditional and uncommon methods of creating outdoor and indoor water features. Many of the strategies learned from some of the largest global producers of artificial rock waterfalls in South Korea and abroad are employed by WaterfallNow. It is simple, cost-effective, and generally a good idea. The real challenge lies in the ability to solve problems and create works of art that are visually appealing as well as pleasing to the ear. Our natural ability and experience which was honed over the years has enabled us to create 100% custom created water features that can go virtually anywhere. We believe the attractions that people will talk about most are those that are not just beautiful but also rare, uncommon, unique, and something that almost everyone wishes they had. While the fact remains that not everyone will be able to partner with us, WaterfallNow does attempt to cater to as wide a client base as it can. Whether you enjoy the white noise provided by a waterfall to drown out the sound of traffic or the trickling sounds of water just know that everything we do is 100% custom hand-made. You can choose the colors, lighting effects, fog, mist, plantation and so forth. Perhaps you just want something that most people will enjoy? We got you covered. Are you planning for something unique to enhance your next renovation project? Why not learn how you can partner with us to create a beautiful indoor water feature or custom outdoor garden waterfall? BBQ season is just around the corner and it would be unfortunate if we were too busy to serve you in time. Call 604-724-4008 or 778-788-8603 for a FREE estimate and to book a date for your own custom indoor water feature. Are you looking for ideas for your garden waterfall project? WaterfallNow provides artificial rock garden waterfalls and water features for ponds and virtually anywhere you can imagine. Does your project currently look something like this? Here are some ideas to help visualize the potential of what it could be. You too can enjoy a staycation in the comfort of your own backyard with one of our garden waterfalls. You don’t need to own a multi-million dollar property to be accepted as our client. We can create beautiful artificial garden waterfalls that will get people wondering what it is that you do for a living. Some people can’t even tell they aren’t made from real rock nor figure out how you managed to get something so big into such a small area. 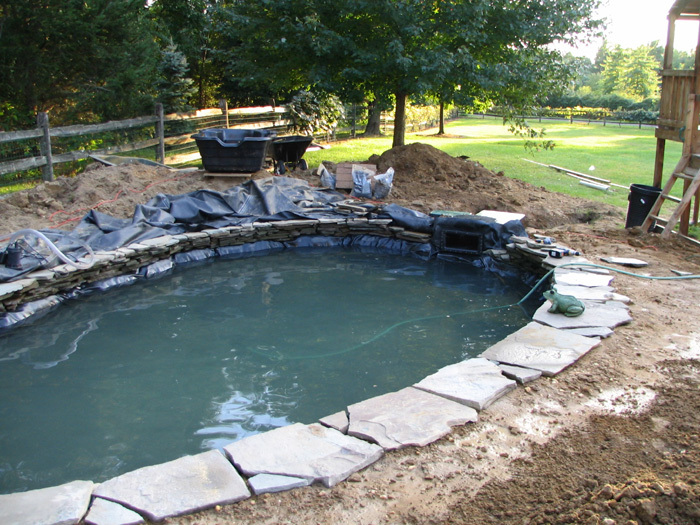 Call WaterfallNow for consultation on the construction of your new pond. We specialize in the creation of custom water features for all clients. Whether you have a small project in your backyard, inside your home, or on the rooftop of your multi-million dollar penthouse suite look no further than WaterfallNow. Our goal is to cater to a wider range of clients with the benefits of our services. We have spent thousands of hours and have failed numerous times when we were developing the system that we currently employ. Had we given up or stopped many years ago there would be virtually no company in the Lower Mainland that could cater to those looking for 100% unique customization and availability to a wider-range of clients. What we do is simple, cost-effective, and ultimately benefits you as the consumers who can enjoy the customization and low-maintenance setups that we provide. Our creativity and vision has enabled us to turn our passion into more than just another darned project. We look forward to what 2014 has in store not just for our own sake but also for the mutual partnerships that we have created thus far. Do you simply need some consultation and guidance for your renovation project? Feel free to give us a call. We know the stress that sometimes accompanies renovation projects. We don’t want you to be blindsided by forgetting one or two critical components to your next project. Garden waterfalls are in high demand because they are beautiful. But what if you could have one designed by professionals? That is what we do at WaterfallNow.